^ a b c d e 有坂 2004, pp. 66-80. ^ Füssel 2010, p. 7. ^ Szabo 2007, p. 2. ^ Marston 2001, p. 12. ^ Dull 2005, p. 8. ^ a b Marston 2001, p. 14. ^ Browning 1975, p. 56. ^ Duffy 2015, p. 59. ^ a b Dull 2005, p. 68. ^ Dull 2005, p. 69. ^ Dull 2005, p. 39. ^ Marston 2001, p. 13. ^ Dull 2005, p. 7. ^ Dull 2005, p. 70. ^ a b Dull 2005, p. 40. ^ a b Marston 2001, p. 15. ^ Anderson 2000, pp. 51-65. ^ Pritchard 2004, p. 356. ^ Dull, Jonathan R. (2007). 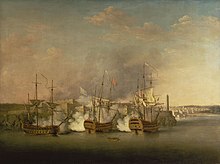 The French Navy and the Seven Years' War. Lincoln NE: University of Nebraska Press. p. 14. ISBN 0-8032-1731-5. https://books.google.com/books?id=QcsnvXeOdW4C. ^ a b Borneman 2007, p. 80. ^ Lee, Stephen J. (1984). Aspects of European History, 1494–1789. London: Routledge. p. 285. ISBN 0-416-37490-5. https://books.google.com/books?id=t9REWs8RAcYC. ^ Till, Geoffrey (2006). Development of British Naval Thinking: Essays in Memory of Bryan Ranft. Abingdon: Routledge. p. 77. ISBN 0-714-65320-9. https://books.google.com/books?id=iIpFoGiz88IC. ^ a b Schweizer, Karl W. (1989). England, Prussia, and the Seven Years War: Studies in Alliance Policies and Diplomacy. Lewiston NY: Edwin Mellen Press. ISBN 0-88946-465-0. https://books.google.com/books?id=rfacoIz38n0C. ^ Black, Jeremy (1999). Britain As A Military Power, 1688–1815. London: UCL Press. pp. 45–78. ISBN 1-85728-772-X. https://books.google.com/books?id=E5E2yDg4VekC&pg=PA221. ^ Simms, Brendan (2008). Three Victories and a Defeat: The Rise and Fall of the First British Empire. London: Penguin Books. ISBN 978-0-14-028984-8. OCLC 319213140. ^ Vego, Milan N. (2003). Naval Strategy and Operations in Narrow Seas. London: Frank Cass. pp. 156–157. ISBN 0-7146-5389-6. https://books.google.com/books?id=MXO5fx1cs5oC. ^ Szabo 2007, pp. 17-18. ^ Lawrence James (1997). The Rise and Fall of the British Empire. p. 71ff. https://books.google.com/books?id=4DMS3r_BxOYC&pg=PA71. ^ William R. Nester (2000). The Great Frontier War: Britain, France, and the Imperial Struggle for North America, 1607-1755. p. 115ff. https://books.google.com/books?id=7Mum6vMM5YwC&pg=PA115. ^ a b Asprey 1986, p. 427. ^ Asprey 1986, p. 428. ^ Asprey 1986, pp. 430–438. ^ a b c Frederick II, Jean-Paul Bled. ^ Asprey 1986, p. 465. ^ Carter 1971, pp. 84-102. ^ Marston 2001, p. 37. ^ a b Luvaas 1966, p. 6. ^ Marston 2001, p. 39. ^ Asprey 1986, p. 454. ^ a b Asprey 1986, p. 460. ^ Marston, Daniel The Seven Years' War, London; Osprey, 2001, pp. 40-41. ^ a b c d e Marston 2001, p. 22. ^ a b Marston, Daniel The Seven Years' War, London; Osprey, 2001 p. 42. ^ Marston, Daniel, The Seven Years' War, London; Osprey, 2001, p. 54. ^ Friedrich der Große, Werke, Geschichte des Siebenjähriegen Krieges. Reprint, P. 39. ^ Stone 2006, p. 74. ^ a b Stone, David A Military History of Russia: From Ivan the Terrible to the War in Chechnya, New York; Praeger, 2006, p. 75. ^ Fish 2003, p. 2. ^ Terrage, Marc de Villiers du (1904). Les dernières années de la Louisiane française （フランス語）, E. Guilmoto, p. 151. ^ Reflexiones Histórico-Militares que manifiestan los Motivos Porque se Mantiene Portugal Reino Independiente de España y Generalmente Desgraciadas Nuestras Empresas y que Lo Serán Mientras No se Tomen Otras Disposiciones （スペイン語）, Borzas, 28 November 1772; cited by Jorge Cejudo López in Catálogo del archivo del conde de Campomanes, Fundación Universitaria Española, 1975, legajo (file) n. 30/12. ^ The Report of the General Officers appointed by His Majesty's Warrant of 1st November 1757, to inquire into the Causes of the Failure of the late expedition to the Coast of France, published by A. Millar, London, 1758, p. 112. ^ Revue anglo-française, Tome Quatrième, Poitiers, 1836, p. 46. ^ J.W. Fortescue,A History of the British Army, MacMillan, London, 1899, Vol. II. p.345, According to Fortescue, of the 1400 men that he cites in the rear guard: "...750 officers and men were killed and wounded...the rest of the rear guard were taken prisoner." ^ Ojer, Pablo- La Década Fundamental en la Controversia de Límites entre Venezuela y Colombia, 1881–1891 （スペイン語）, Academia Nacional de la Historia, 1988, p. 292. ^ Sen, S.N. (2006). History Modern India (Third ed.). Delhi, India: New Age International. p. 34. ISBN 8122417744. https://books.google.com/books?id=ga-pmgxsWwoC&pg=PA35. ^ James L.A. Webb Jr, "The mid-eighteenth century gum Arabic trade and the British conquest of Saint-Louis du Senegal, 1758." Journal of Imperial and Commonwealth History 25#1 (1997): 37-58. ^ Kennedy, Paul (1976). The Rise and Fall of British Naval Mastery (book) (new introduction ed.). London: Penguin Books. ISBN 0-684-14609-6. ^ a b c d e f g h i j k Marston 2001, p. 90. ^ a b Stone 2006, p. 70. ^ Stone, David, A Military History of Russia: From Ivan the Terrible to the War in Chechnya, New York; Praeger, 2006, pp. 70-71. ^ a b Marston, Daniel The Seven Years' War, London; Osprey, 2001 pages 90-91. ^ a b Marston, Daniel The French and Indian War, London; Osprey, 2002 pages 84-85. 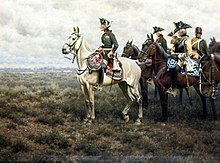 ^ Marston, Daniel The French and Indian War, London; Osprey, 2002 pages 85-87. Anderson, Fred (2000) (英語). Crucible of War: The Seven Years' War and the Fate of Empire in British North America, 1754–1766. Faber and Faber. 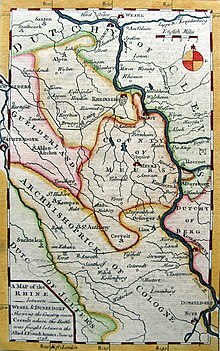 http://www.amazon.com/Crucible-War-British-America-1754-1766/dp/0375706364/. Asprey, Robert B. (1986) (英語). Frederick the Great: The Magnificent Enigma. New York: Ticknor & Field Publishing. Borneman, Walter R. (2007) (英語). 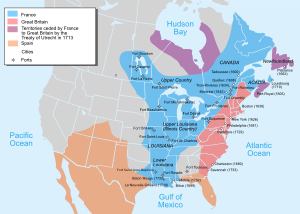 The French and Indian War: Deciding the Fate of North America. New York: HarperCollins. p. 80. ISBN 978-0-06-076184-4. https://books.google.com/books?id=O7TZqbj_6BYC. Browning, Reed (1975) (英語). 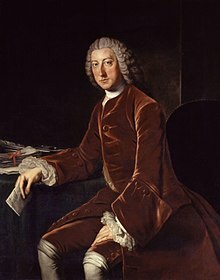 The Duke of Newcastle. Yale University Press. Burk, Kurt (1995) (ドイツ語). Handbuch zur Geschichte der Festungen des historischen deutschen Ostens. Biblio. ISBN 3-7648-2454-9. Carter, Alice Clare (1971) (英語). 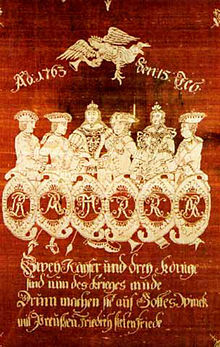 The Dutch Republic in Europe in the Seven Years' War. MacMillan. Dodge, Edward J (1998) (英語). Relief is Greatly Wanted: the Battle of Fort William Henry. Bowie, MD: Heritage Books. ISBN 978-0-7884-0932-5. OCLC 39400729. Duffy, Christopher (2000) (英語). 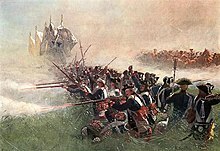 Instrument of War: The Austrian Army in the Seven Years War. Duffy, Christopher (2008) (英語). By Force of Arms (The Austrian Army in the Seven Years War), Vol II. Duffy, Christopher (2015) (英語). Russia's Military Way to the West: Origins and Nature of Russian Military Power 1700-1800. Dull, Jonathan R. (2005) (英語). The French Navy and the Seven Years' War. University of Nebraska Press. Füssel, Marian (2010) (ドイツ語). Der Siebenjährige Krieg. Ein Weltkrieg im 18. Jahrhundert. München: Beck. ISBN 978-3-406-60695-3. García Arenas, Mar. El periplo ibérico del general Dumouriez: Una aproximación a las relaciones diplomáticas hispano-portuguesas (1765–1767) （スペイン語）. Revista de Historia Moderna, Anales de la Universidad de Alicante, n. 22, 2004, pp. 403–430. ISSN 0212-5862. Luvaas, Jay (1966) (英語). Frederick the Great on the Art of War. New York: The Free Press. Marston, Daniel (2001) (英語). The Seven Years' War. Osprey. ISBN 1-84176-191-5. http://www.amazon.com/Seven-Years-War-Daniel-Marston/dp/1579583431/. Nester, William R. The French and Indian War and the Conquest of New France (University of Oklahoma Press, 2014). Pritchard, James (2004) (英語). In Search of Empire: The French in the Americas, 1670–1730. Cambridge: Cambridge University Press. p. 356. ISBN 0-521-82742-6. https://books.google.com/books?id=kK9wa98I4eEC. Stone, David (2006). A Military History of Russia: From Ivan the Terrible to the War in Chechnya. New York: Praeger. Szabo, Franz A. J. (2007) (英語). 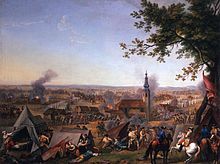 The Seven Years' War in Europe 1756–1763. Longman. ISBN 0-582-29272-7. https://www.amazon.com/Seven-Years-War-Europe-1756-1763/dp/0582292727/. Marc de Villiers du Terrage (1904) (フランス語). Les dernières années de la Louisiane française. E. Guilmoto. https://books.google.com/books?id=L_1YAAAAMAAJ.